Before the NASCAR Camping World Truck Series Kroger 200 at Martinsville Speedway, the tour's most decorated driver Ron Hornaday Jr has never won at the historic short track. Despite winning on the almost every under one mile oval the Truck Series have visited (including a multitude of race tracks long since vanished from the modern NASCAR schedule), 16 starts for Hornaday had left the 46-time race winner and reigning series champion snake-bitten. After a green-white-checker finish where Hornaday fended off a determined Toyota driven by Kyle Busch, the driver of the #33 Chevrolet crossed the line first at Martinsville. 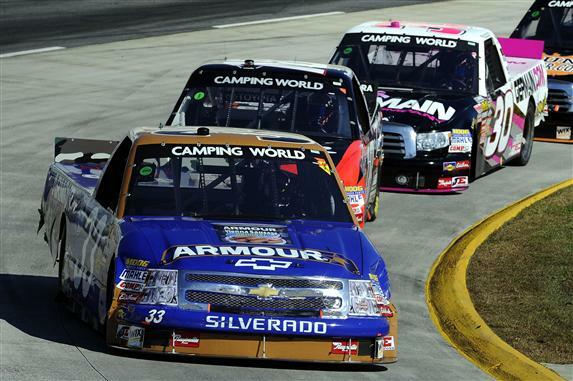 Leading just 11 laps in the Kroger 200, those laps came at am important time for Hornaday's #33 Chevrolet. As Hornaday did not present himself until the end of Martinsvile's Kroger 200, the race's lead was initially held by pole sitter Kyle Busch for the first 7 laps. As Sprint Cup regular Busch wanted to fill his trophy room with more Camping World Truck Series honours, his lead was maintained only until another Cup star surged past. The Kevin Harvick drove his #2 truck to what would be 35 laps. Typical of Camping World Truck Series rounds on the 0.526 mile short oval, cautions came often during the 200 lap distance. A total of 11 yellow flags slowed the field for 59 laps. Two crashes occurring in the last 1/3rd of the Martinsville race proved to most extreme. Swarming into turn 3 on lap 165, the lead lap trucks of Timothy Peters and Matt Crafton made contact. Getting punted on the restart, Timothy Peters skated up the race track getting bumped by the #23 of Jason White and the #3 of Austin Dillon. Losing momentum, Matt Crafton dived below Timothy Peters into turn 3 as two additional vehicles were matched side-by-side. Four-way into the turn, crowded real estate caused Crafton to touch the #17 Toyota one more time propelling Peter's truck hard into the outside barrier. The wrecked #17 car required almost 9 minutes of red flag time to clean up so the precious late laps of the Martinsville race would wrap up. Crafton continued on the finish 10th but the previous race winner Timothy Peters was forced into retirement due to heavy front-end damage to his #17 Toyota. While Thorsport Racing's #88 Chevrolet of Matt Crafton fared well in the race's running, the #13 teammate vehicle of Johnny Sauter saw his fortunes turn from good to bad. Leading 49 laps before the halfway point of the Kroger 200, Sauter's day went south after an impact from James Buescher's #31 when the two were fighting for position into turn 1 on lap 159. As the #13 Chevy truck attempted to circulate for a finish, a rear tailgate cover began to lift off and hang loosely on the vehicle's rear causing a serious concern that Johnny Sauter would be black flagged. On lap 183, the Thorsport Racing crew instead to convinced the #7 Toyota of Justin Lofton to knock off the loose body panel under race condition. A trick exploited on several occasions through racing to avoid losing ground on pit road, it backfired this time in this case. As the #7 truck pushed against the rear sheet metal to rub off the tailgate cover of the #13 Chevy, the Toyota launched itself over top of the rear end crushing through Sauter's rear bodywork. 3rd in the 2010 Camping World Truck Series points, Johnny Sauter could do no better than 21st place. Justin Lofton would finish in 13th place but made few friends on the day. Also making contact with Kevin Harvick at the end, the #7 truck driver earned a conversation with 'Happy' Harvick. Topping the laps led count on with 83 circuits, Todd Bodine convincingly paced the Kroger 200 at Martinsville Speedway through the second half of the event. However, the #30 Toyota did not have the strength in the final short runs to hold off competitors. As first Kyle Busch's #18 Toyota maneuvered his way around Bodine, it was Ron Hornaday on lap 196 who took the lead and the race win. Todd Bodine finished 3rd in the final results and proceeds to lead the 2010 NASCAR Camping World Truck Series by a giant 282 point gap on Aric Almirola. Next on the tour's schedule is the Talladega event promising to be a wild race on October 30th.